Better than stashing money underneath a mattress and hoping your house doesn’t burn down, banks offer consumers a way of protecting their financial assets in addition to a bevy of other services, from credit cards to mortgages and even investment portfolio management. However, while this sounds nice, it’s not always a great relationship between the bank and client. Complaints against leading lending financial products and institutions are recorded in the Consumer Financial Protection Bureau’s database. We examined these complaints against the six most common banking services to understand what’s being logged and the issues most dealt with. Continue reading to see the financial services that are doing their best for their customers, as well as those that may be leaving more headaches than deserved. For five out of the six financial solutions, 2016 represented the majority of consumer complaints logged against their banking products. 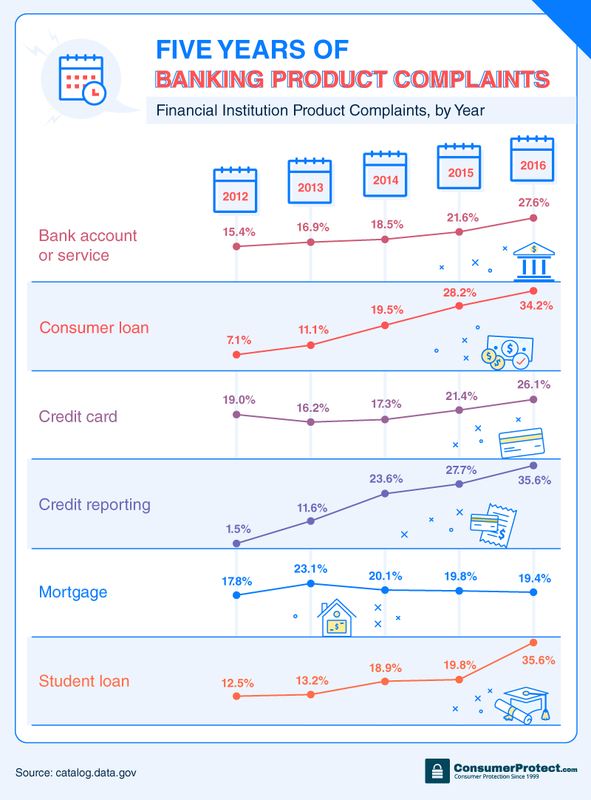 Almost 36 percent of the complaints recorded against student loans and credit reporting occurred in 2016, the highest for any product. With a total estimated $1.4 trillion in student debt, the average U.S. graduate owes over $37,000 – a six percent increase from the year prior. The cost of higher education in the U.S. has long been under criticism compared to other countries, and reduced accountability for loan issuers has left many borrowers exposed to the tremendous debt that meets them as they leave college and prepare for the real world. Mortgages saw a slightly lower percentage of complaints from 2015 to 2016 (around 19 percent). In 2016, fixed mortgage rates fell to match an all-time low. For new homebuyers, these rates can help them invest in their property rather than renting, and for existing homeowners, it may offer the opportunity to refinance existing loans to more manageable rates. Mortgages accounted for over 30 percent of the 722,684 complaints filed. Yes, the most complaints came from what is often considered a person’s largest purchase: a home. It could be that some banks have recognized this kind of loan may not be good for business. In a memo to shareholders, JPMorgan CEO Jamie Dimon outlined that mortgages are offered as a benefit to customers, not because it’s a sound investment for the bank. The bank also reduced its number of mortgage offerings from 37 to 15, admitting that FHA – Federal Housing Administration – lending is too costly. These loans represent many people who are purchasing their first home and are emotionally tied to the approval process. Perhaps this is why it’s also the biggest point of contention between banks and customers. When banks are willing to admit problems, there are a few other default responses. “Closed with relief,” “closed with monetary relief,” or “closed with non-monetary relief” are tags lenders use to show some care for legitimate claims issued by customers. Close to 30 percent of credit reporting complaints were resolved with a non-monetary solution, which may involve the bank making amends to inaccurately reported information. As banks continue to focus on new customer acquisition, communication is crucial to enhancing customer engagement that helps create loyalty between financial institutions and their customers. Due to the ever-growing integration of technology with daily life, some banks have even expanded their online chat options to include social media interactions like Facebook. While online correspondence was the among the most common feedback methods, it was also among the least likely to result in timely responses, according to their customers. 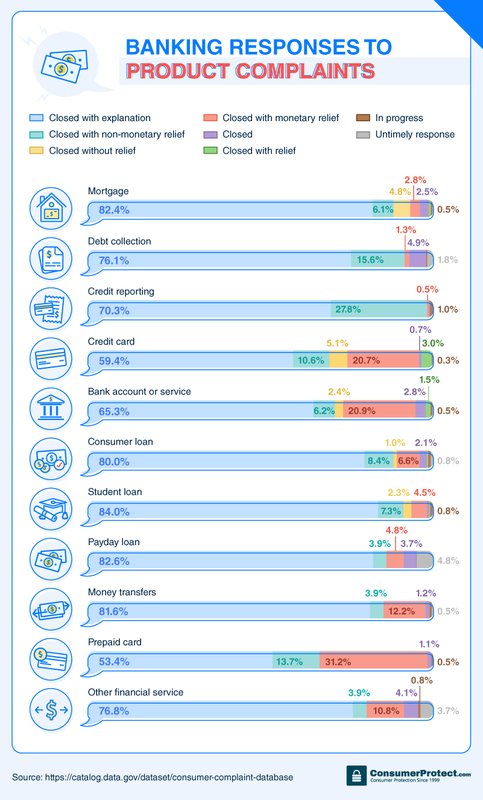 Of people who communicated with their banks via referral, nearly 98 percent received timely responses from those connections. Nearly 97 percent of complaints relayed over the phone received a timely response, while over 98 percent of customers had a quick turnaround for their issues sent by postal mail. 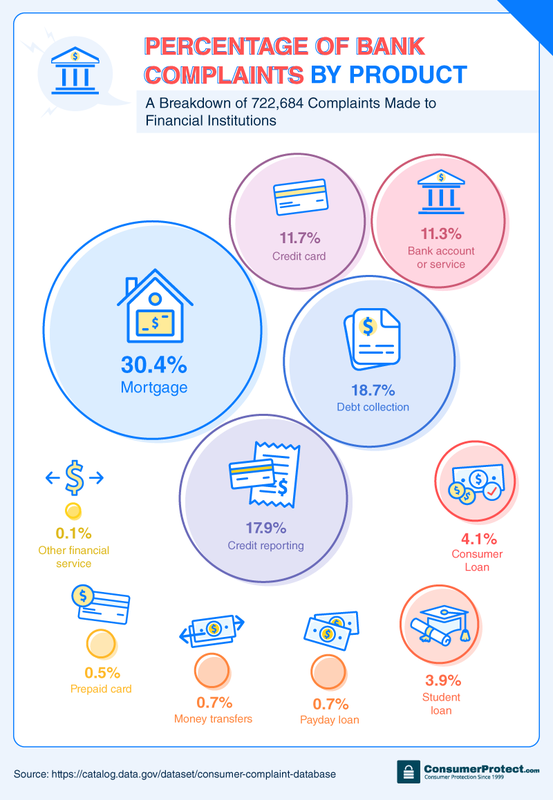 Delaware, with a state motto of “Liberty and Independence,” echoed these desires with almost 390 complaints against financial institutions per 100,000 residents. 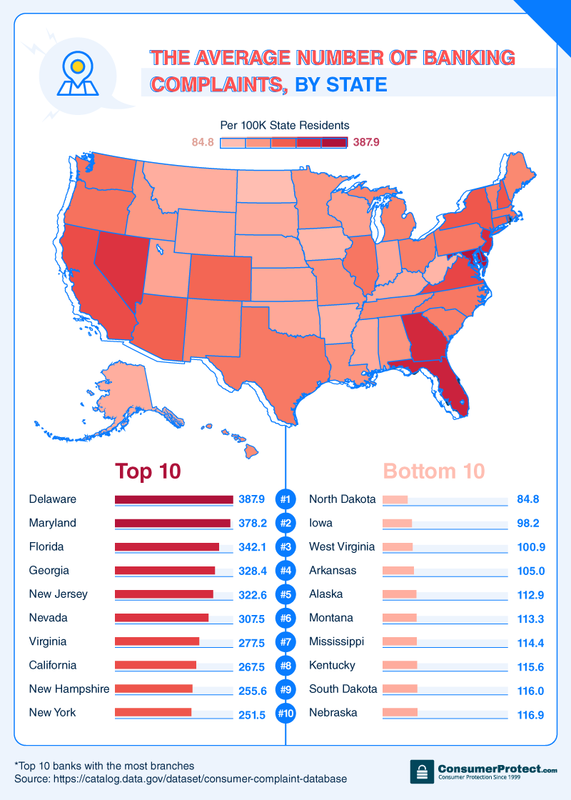 Florida, Georgia, Maryland, New Jersey, and Nevada all exceeded 300 complaints per 100,000 residents. The six most popular banking products in America are not perfect. Nearly all saw more complaints in 2016 than any other year since 2012. In a quest for higher profits, many have looked to acquire other banks and reduce or limit services to meet their investors’ needs. If you’re concerned you’re being treated unfairly, please partner with Consumer Protect. We are keenly aware of the scams and tricks lenders play to pocket your money, and we don’t want anyone getting caught in their traps. 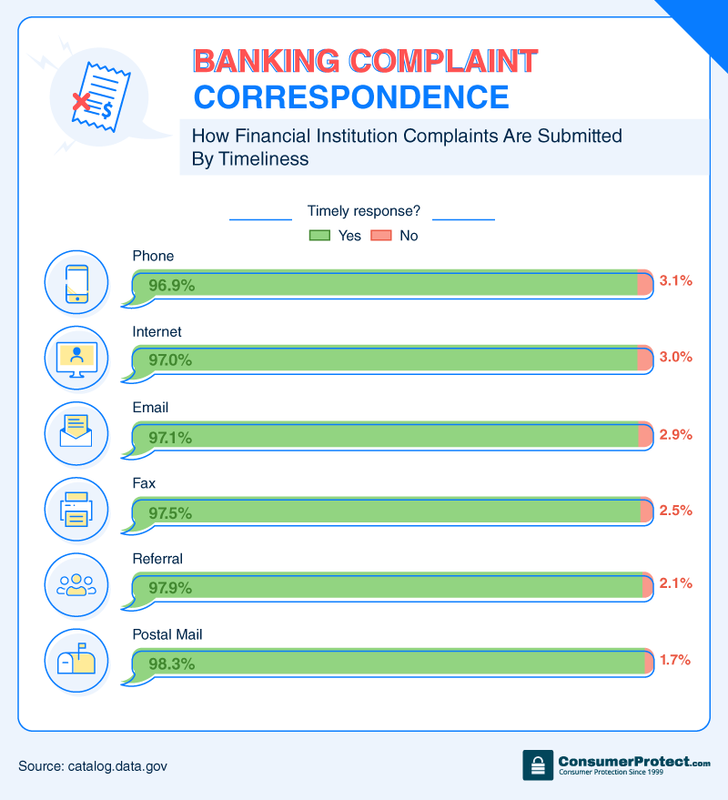 We tapped into the Consumer Financial Protection Bureau’s database of complaints against financial institutions to determine the different reasons people complain about their banks. We looked at the top 10 U.S. banks with the most branches for a more granular look at complaints per branch. We invite you to share this information with other financial consumers for noncommercial purposes. When doing so, please provide a source that leads back to this page, so readers can learn more about bank complaints and this project.